Powers/Abilities: His armor allows him to fly, and he can fire bullets, lasers, or even micro-missiles from his gauntlets. His built in site allows him to see into the infra-red or ultra-violet spectrum. Height: 6' 3" Weight: 220 lbs. Warrant's origins are unknown. He has a record of being volatile, and of causing a high body count during his missions. (Web of Spider-Man#110) - US agent Warrant was called in to take down the Lizard, who had escaped from the Vault. Dr. Ashley Kafka protested his use, due to his history, but she was overruled. Warrant smashed his way into the apartment of Curt Connors, in search of the Lizard, but finding only Bill and Martha Connors. Spider-Man arrived to protect the Connors, but Warrant blew up the apartment, knocking out Spidey and Martha, and took Billy hostage, figuring he could use him against the Lizard. (Web of Spider-Man#111) - Warrant flew Billy out to the Florida Everglades, where he found Spider-Man--who had beat him down there--fighting the Lizard. Warrant showed that he had the Bill hostage, but the Lizard didn't give a rat's @$$ about that little mammal, and instead hurled a bulldozer at the both of them. Spidey knocked the Earthmover out of the way, and the Lizard went after Warrant directly. After some struggle, Warrant knocked the Lizard into a patch of quicksand, into which he sank and died (yeah right!). Warrant let Billy return to his mother, and his agent, Reynard tried to smooth things out with Kafka and Spider-Man. (Web of Spider-Man#112) - Uncertain how to deal with the situation Warrant had caused, the US government was only too happy to cut him loose. Based on Reynard's recommendation, Warrant and he formed a freelance bounty hunting operation, Warrant, INC, which the government could employ as needed, but not have to take responsibility for. (Web of Spider-Man Annual#10/2) - Warrant was hired to protect Senator Gaines, who was targeted for death by Daze. Warrant saved Gaines from jumping to his death, and managed to subdue Daze when his infra-red goggles proved able to filter out his power's frequency. (Web of Spider-Man Annual#10) - Warrant and Reynard debated whether Ravencroft would be able to succeed, and how much money they might make when they were hired to clean up the mess if it did collapse. (Nightwatch#4) - Warrant was commissioned by the Justice Department to bring in Gauntlet. When Warrant caught up to him, Gauntlet was engaged in a struggle with Vandal, whom Warrant had an old grudge against. 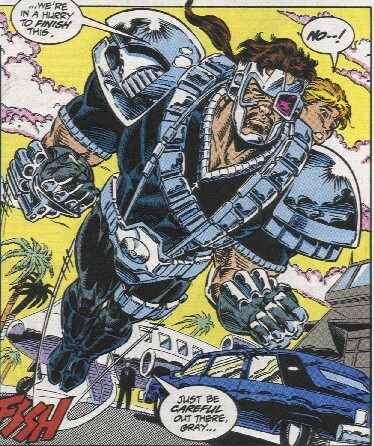 However, Vandal proved just to be a hologram, and while Warrant tried futilely to injure Vandal, Gauntlet sucker-punched him. Gauntlet fled, but didn't get too far, as Nightwatch had also tracked him down. Nightwatch and Warrant's combined efforts brought down Gauntlet, though Nightwatch allowed Warrant to take all the credit, and the full payment for his bounty. (Spider-Man: The Arachnis Project#1-2) - Warrant showed up to take in Sneak Thief to earn her bounties in several states. However, Sneak Thief had been caught in the middle of a struggle between Spoiler and Spider-Man. As the three fought over her, Sneak Thief escaped, but Warrant picked up on her ultra-violet beam usage and tacked her down. He returned a priceless antique to the museum curator from which Sneak Thief had stolen it, though it was badly damaged in the preceding struggle. No sooner did Warrant fly off, then Sneak Thief was abducted by another group, the Diggers, agents of Roland Treece. Comments: Created by Joey Cavalieri and Dave Hoover...or Terry Cavanaugh and Alex Saviuk. They both are missing their left eye, are of similar build, have long, dark hair, etc. In Marvel Comics Presents, the left half of his face is all decayed, and he wears ripped up jeans, and uses a few techno-weapons. The guy from Web is techno all the way, with a high tech suit, and cybernetic implants on his face. "Dead is easier--and safer--than alive...and overkill is best of all." He served as Warrant's agent, both when he worked with the government, and working as a free agent in Warrant, INC.